In Atlanta, Chicago, and Los Angeles, trauma victims are hustled into emergency rooms at a pace as steady and unsurprising as the siren wails that echo off city buildings and urban sprawl. Dr. Jason Prystowsky, who has worked as a member of ER staff in all three of those cities, is no stranger to the tragic routine of urban trauma centers. But in the city of Santa Barbara, where Prystowsky works at Santa Barbara Cottage Hospital, he has, for several years, settled into a less turbulent regimen including families, a sizable senior population, and college students filing in at late-night hours, with the latter’s familiar pale hue a product of one too many pitchers. On May 23, 2014, in the span of an hour, seven victims, several of them with gunshot wounds, were admitted to Santa Barbara Cottage Hospital minutes after Prystowsky and hospital staff received news of an active shooter. All seven of the victims admitted to the hospital lived, as did the other four victims treated at Goleta Valley Cottage Hospital. Six victims — George Chen, Katherine Cooper, James Hong, Christopher Michaels-Martinez, Weihan ‘David’ Wang, and Veronika Weiss — all of them University of California, Santa Barbara students, died on scene that night. 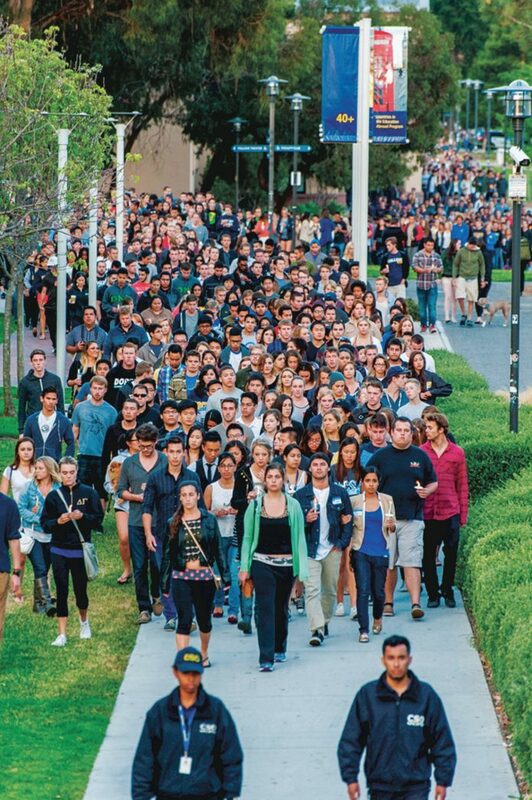 Three years later, the brave work and ongoing grief carried by first responders like Prystowsky are the stories that didn’t make national headlines, but remain an important part of Isla Vista’s living history and continuing healing process. UCSB staff member Jim Caesar was, like many first responders, a behind-the-scenes orchestrator of strength and readiness on May 23. As campus emergency manager, Caesar’s job is a little unusual; each week, Caesar, who has been with the university since 2009, sits in a bunker-like building off campus and prepares for the worst. From tsunami evacuation plans to accommodations for campus residents in the case of a flood, the emergency response team is the community’s living survival guide. On the night of May 23, Caesar watched the news unfold and quickly got to work. With a team that included Chancellor Henry T. Yang and fellow executive administrators, Caesar and student affairs staff opened up a call center that night for worried parents and concerned students, some of which were given campus housing to escape the chaos of I.V. that night. Taking cues from the aftermath of the 2007 Virginia Tech shooting, the team reached out to A.S. President Ali Guthy, who had only been sworn in two days prior to the shooting, to plan the memorial held on Wednesday. Caesar said that Guthy handled the following weeks with “amazing confidence and grace.” Collectively, Caesar and administrators called to cancel class in the days following to ensure that students had the space and time they needed to heal. Three days prior to the tragedy, Caesar’s team, along with the Santa Barbara County Fire Department, gave a disaster preparedness seminar to members of Alpha Phi, whose lawn would later be adorned with flowers and candles from the community. Caesar still uses the photo they took from that day, the sorority sisters and firemen framed by life-size Greek letters, in his presentations to fellow emergency response teams at other universities. At 2 a.m. on the morning following the tragedy, hours after Caesar and his team began their response efforts, Dr. Peter Claydon received a call from a colleague asking for aid at the scene. By 3:30 a.m., Claydon was helping police debrief their experience of the night’s events. Later, Claydon sat down with Alpha Phi and Delta Delta Delta sorority sisters, who together had witnessed the shooting of two Tri Delta sorority sisters, Katherine Cooper and Veronika Weiss, and one survivor. By the time Isla Vista residents woke up that morning, Claydon returned home while CAPS counselors took over. “Yes, I would say it was difficult to process. This is a home that I’ve shared with so many of these students,” said Claydon, who lived on Sabado Tarde during his time as an undergrad at UCSB. Claydon, who worked with Student Health’s Drug and Alcohol Program for ten years before moving on to the Santa Barbara Youth Project, applauded the work of UCSB staff, police, and counselors who responded that night and in the weeks following. When asked if he had attended the memorial event the Wednesday following the tragedy, Claydon said simply, “I wasn’t ready,” expressing his grief and condolences instead in a letter to the Alpha Phi sisters he had met that night. Like so many first responders, this was, unfortunately, not Claydon’s first mass casualty incident. Claydon had offered his support services to the families and witnesses of the 2006 Goleta Post Office Shooting that left seven dead. Director of Counseling and Psychological Services Jeanne Stanford, who rallied together counselors from multiple campus departments the following morning, was unfortunately acquainted with campus tragedy herself, having been present for the 2001 incident in which a suspect killed four people and injured one with his car on the 65 block of Sabado Tarde. UCSB alumna and Tri Delta sister Lauren Trujillo was one of the many that benefited from CAPS services following the tragedy. Though not a first responder, her work, as she waded through her own grief of the loss of her two sorority sisters, is heroic in itself. At a panel commemorating the three year anniversary of the healing spaces that evolved out of the tragedy, Trujillo presented her archive work of the “We Remember Them” exhibit, an archive that preserved hundreds of items left by community members in the wake of the tragedy. In the summer of 2015, the items, curated by Melissa Barthelemy and Rebecca Metzger, were displayed in the Red Barn museum space on campus and attracted over 1,800 visitors. “I know every victim has people like me who love them dearly and continue to miss them every day,” said Trujillo through tears. Behind her were images of a water polo ball and ballet shoes representing the passions of Tri Delta sisters and victims, Katherine Cooper and Veronika Weiss. Trujillo spoke of the swell of community support in the aftermath. The Greek community gathered at her sorority house door to walk the girls to the memorial service held Wednesday. Her legacy, and the legacy of the victims, are now a permanent collection in UCSB Davidson Library’s Special Collection.